A comment I made the other day on "Wellymonster's" thread about how vast the continent of Australia is got me thinking of a trip I did as a teenager in the early 1980's along The Gunbarrel Highway. The highway straddles the SA/NT border before penetrating deep into central WA through Warburton, finishing at Carnegie Station around 1400km's away. My parents had a teacher friend who worked in the A.P.Y Lands in the North Western corner of South Australia. He had invited us up during the school holidays. Mum worked in an old folks home in Glenelg at the time and looked after this old fossil named Cyril Brady who in the early part of the 20th century established the Victory Downs Cattle Station, which is the start of the eastern end of the Gunbarrel Hwy. When he heard we were going up that way he insisted that we visit his station and gave us people to contact, including the son of his Aboriginal Station Hand who still worked on the station. We got the necessary permits and drove as far as dads Commodore wagon could take us before we were met by John the teacher who was driving a heavy duty 4x4 school bus. The "Highway" leading west from Victory Downs is a pretty loose description as its mostly a rough single lane track but the terrain and landscapes really take your breath away. 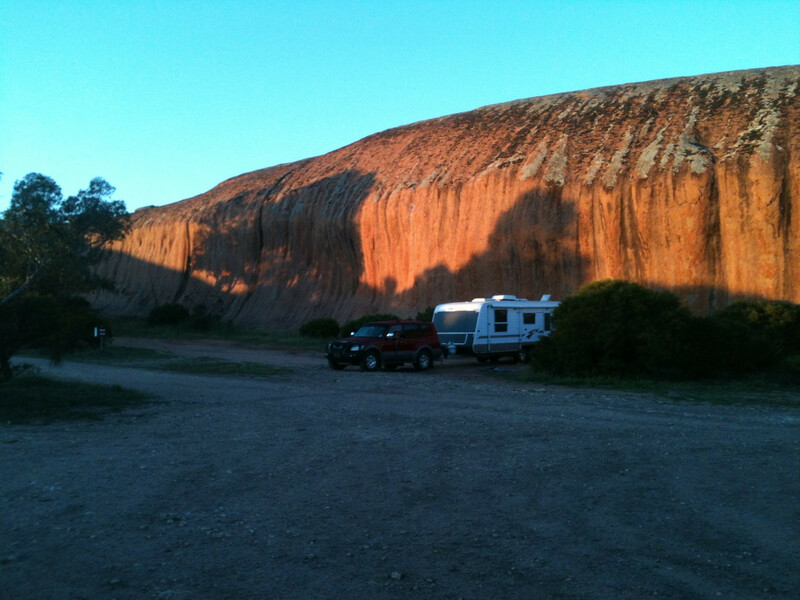 The highest mountain ranges in South Australia, smooth granite billabong swimming holes, and caves with Aboriginal rock art and cave paintings. If you knew where to look its truly an amazing region. The track got really rough as it headed west. Our bus ended up breaking down with the fuel system completely shitting itself. My dad who is an Engineer rigged up a Jerry tank next to the drivers seat with a plastic syphon hose feeding fuel directly into the carburettor under a hatch between the front seats. As fast as gravity fed fuel ran into the engine, that was how fast the bus went. When we wanted to stop, dad just pulled the hose out of the carby. We drove for nearly 1000km like that till we got repairs done at a station. I didn't really appreciate at the time how unique, amazing and special where we'd been and what we saw was. To tell you the truth I've never thought much about that trip till earlier this year. One of the younger lads in my town has been going up to the APY Lands for work building houses in the Aboriginal missions for the government. He told me that permits to travel through the Lands are nearly impossible to obtain these days. tyres under the paintings, blackening and obscuring them from view but also preserving them with a covering of fine rubber soot. I realise now how lucky I was to do the Gunbarrel Highway and I've never met anyone else who has done it? So has anyone else on here driven on the Gunbarrel Highway or have any cool stories of other way out corners of our continent? I think your dad sounds like a legend Yorkes. The 80's was the end of a classic era in Australia, sounds like an adventure. How old were you? I was 13 or 14 at the time shaun. I think I had my 14th birthday whilst on that trip. Old enough to remember but still a bit too young to appreciate what a big deal going off the beaten track to the centre of the continent was. It feels like you have landed on the moon its so remote. I don't think mum and dad knew exactly what we were getting ourselves into up there but we were with people who lived and worked in that environment. Still no satellite phones in those days, it was a pretty out there thing to do. My parents have always been a little nuts! Last year they went to Ethiopia for a month even though they're now in their 70's checking out some of the foreign aid projects they sponsor. That's their idea of a holiday! Good story YS sounds like you have a good pair of parents. There was a documentary with Ernie Dingo telling the history of Aboriginals coming into Australia and a lot about the places built over 60 000 years ago with paintings in huge man made caves they lived in. Some of the painting showed animals that have been extinct for at least 50 000 years if i remember correctly.Also the spread into different areas and ice age. You might have seen it but its well worth a watch. I haven't done the Gunbarrel, but I have traveled some remote SA country with my father and grandfather from when I was young up to my late teens. I grew up at Bookabie, west of Penong. My grandfather, though white, was an initiated man of the Gugada people, so we did many trips to Gugada land, north of the dog fence, out Ooldea and Maralinga way, into the big sand hill country and up as far as Lake Maurice and Lake Anthony. So with my grandfather being initiated, we had access to tribal lands that were and still are off limits to the average white fella. I recall seeing some amazing rock paintings and carvings, one carving in particular was of two "spacemen" type figures, tall, sporting a round helmet with what resembled light rays emanating from the edges of the helmet. The figures were about 7' tall and carved onto a large, flattish domed rock near a water seep surrounded by nothing but sand as far as the eye could see in all directions. I remember my grandfather saying that I really should not be seeing the carvings as I was too young, and the spirit being too strong would kill a young uninitiated man if he were black. But as I was a white kid, the spirit would do me no harm. That carving is one of the Gugada's creation stories, of how the men "up there" (pointing to the sky as a Wadi would tell the story), put black man on the earth. Dad, myself and hopefully my older brother if he can make it are planning to do a trip out that way next winter when the heat is not so intense. And as all three of us are accepted men of the Gugada, we'll be able to go places that are only reserved for initiated men, as long as we have one of the Wadi's with us. Next year can't come round fast enough, it'll be a treasured experience. A good read if you can find it is The Gunbarrel Highway by Len Beadell. Len was the surveyor given the task of building service roads through this part of Oz. From what I've been told since reading this book many years ago is that Len didn't let the truth get in the way of a good story. My grandfather knew him, said he was a top bloke but an even better story teller. My parents have got one of his books tripper. It's called Too long in the Bush. He wrote a series of books about his years in the outback but I haven't read them. I might have to borrow them now. I think there's a track called The Anne Beadell Highway named after his wife that runs north off Highway One in the Bight and leads to Maralinga? I've never been on it but maybe that's the one you drove on? I know Len Beadell was tasked with finding a suitable location for the high altitude rocket range that eventually became known as Woomera. He also selected the site of the top secret Brittish Atomic Testing Facility at Maralinga. A weather station at Giles which is up near The Gunbarrel Highway was established so they would know which way atmospheric winds would take the fallout from the nuclear detonations. So his survey work really covered a lot of different objectives for the government. I even heard he took a crash course in dentistry as many of his workers would get rotten or broken teeth whilst mid way through an expedition. He performed a total of 29 tooth extractions on his men during his years working in the desert. They say he was the last of the great Australian explorers. Quite a character! Yeah, Len's books are worth a read, I've read Too Long in the Bush and Blast the Bush, man sure was a character. The dentistry gets a mention a few times in the books, bloody savage way to go about it but better than nothing at all way out in the sticks. He and my grandfather (George) met each other during the Maralinga nuke testing days. George would go into remote country down wind of a test and clear out any Gugada people that were in those areas. One of those tests was so big that it cracked Geaorge's house walls and concrete water tanks at Bookabie. The military fucked up with the wind predictions too on the test, the fall out was heading our way but a wind change at the last minute shifted it back into the desert country. The Anne Beadell Hwy goes from Yalata through to Maralinga, skirting the sand hill country to the NE, one hell of a track that one. Most of the travels I did started on the dog fence service road, that was the northern boundary of our property, and then up through bush tracks and sand hill country that had no tracks in Series I & II Landrovers. My grandfather used to say the Leyland brothers claim to being the first to travel that country east to west was the easy cop out, he reckoned if they wanted a real claim to fame they should have gone south / north. By travelling east /west, they would navigate their way through the sand hills by choosing the path of least resistance, going through the areas where the hills petered out. South / north would have meant going over the hills, and some of those are 100m high. I have memories of endless hill climbs, getting bogged to the axles in the softest of sand and flat tires galore. But also memories of the vastness and beauty of that immense country, taht's why I can't wait to go back next year...it's one place on earth guaranteed not to have changed. When I made that comment about Len not letting the truth get in the way of a good story, I didn't mean that in a derogatory way. Your right, he was the quintessential aussie explorer, George said he always had a good yarn to tell, but with the flair of a real bushmen who had lived and seen more than most. But so was George, cut from the same cloth. They were the kind of guys ya want to spend an evening round the camp fire with. Nice past Yorksurfer, its great to hear of similar people with awe inspiring dedicated parents that take their family on amazing journeys. Journeys that we never forget as kids and help us develop in to real fairdinkum humans. I myself have never been down those ways, sounds like you need to be set up to travel in those conditions. Flying to Perth and back, I often take time to study that part of the world, it is so vast, desert looking sand hills for as far as the eye can see. Here's a little story from when I worked in Karratha for 10 months (prick of a place) to say the least, I hated it. My mate and I decided to go exploring one Sunday, having heard of a valley up on the peninsula, which we were told of 20-30,000 year old Aboriginal carved rock art. Once we started into this desert-less rock bound valley we found some carvings, the further we walked the more carvings we sighted, we both meandered of in different directions. After about 2 hours later we found each other, just absolutely spell bound, this place had the most incredible aura which I cannot explain to this day. The carvings were about 5-6mm deep, of various art , Kangaroos, foot prints, snakes, clouds etc they were everywhere. I tried scratching the same rock back and forth for 5 minutes and was amazed that all I got was a scratch, like I said these carvings were 5-6 mm deep, It would have taken days, if not weeks of scratching to get the end finish. We both found out later that we were supposed to have elders consent to walk the valley, little did we know..? We both left no foot prints probably only bum prints from sitting down and taking it all in, but respect we both had of such a mystical place. Yorksurfer these cave paintings on the Gun barrel Highway, who set the tyres on fire. Yesterday I flew over the York Peninsula coming from Brisbane, apparently dodging the jet stream, theres a lot of nooks and crannies down their champ, looks a pretty interesting coastline. Hey Welly as I understand it the local indigenous people must have set the smoky car tyre fires in the caves to cover up the artwork contained within but I don't think it would have damaged the images. If you have ever seen the soot from burning rubber it's like a dry powder that can be brushed off quite easily. It would probably hide, preserve and protect the paintings more than anything. But I'm just speculating as I heard it from the lad who was doing some building work up in the APY Lands recently. Yeah the bottom end of Yorkes is almost like an island in that there are bays and coastlines facing North, South, East and West so it's always offshore somewhere. But you can really chase your tail around trying to work out where the best waves are. Some travellers seem to just stumble onto and score great waves, others drive around getting frustrated. I think a bit of karma can come into play and obviously local knowlage helps. This guy turned up last summer who was from Byron but had been working in Alice Springs for 6 months without a surf. He had driven straight down the Stuart Highway through Port Augusta and down the peninsula. There wasn't much swell around but he scored a great beachy at Westcape that was just chucking out 3 to 4ft tubes like a machine. His karma seemed to be working out for him! Wellymon, do you do the Brisbane/Perth flight on a regular basis over central Oz? I've been flying over remote areas for the last 20ys going to and from work around the country. 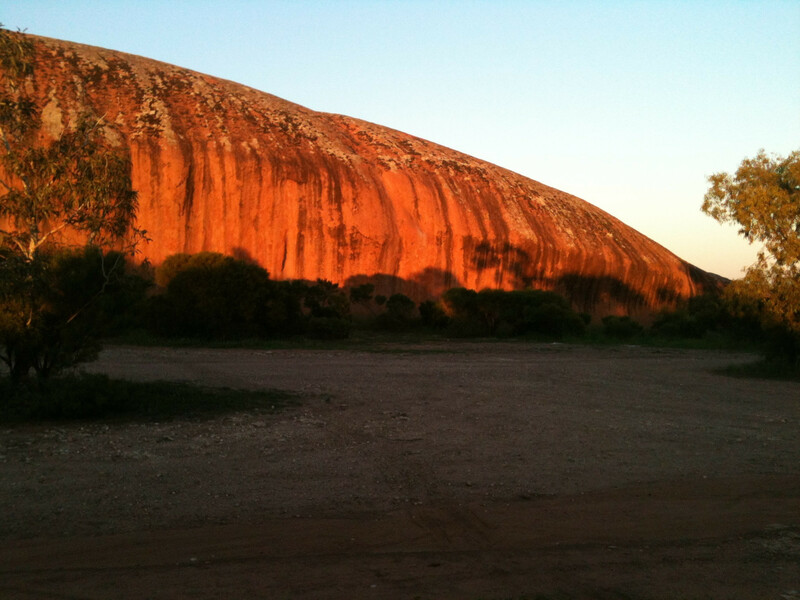 Many times I've looked down on an awesome piece of landscape with no sign of human habitation or impact and wondered if anyone besides Aboriginals have set foot on that patch of earth. And I just wanna ask the pilot, can we pull over so I can get off here. On the flip side, I did half a dozen flights from Joburg to Maun (and back) in Botswana last year over the Kalahari desert, and even though it's vast and desolate, no matter where you looked from the plane there were always signs of human habitation and influence. The Australian interior and remote coastal areas are still so untouched. Who's up for an adventure??? And Karratha, at least you got a special experience out of that place...none of my mates who have worked up there had a good thing to say about it, and they certainly never got to experience what you did. I'm doing Port Hedland right now, my opinion...get me the hell outta here! Bad juju man. You guy's are lucky to have had such adventures as kids, my parents used to go overseas on holidays and leave me and my brother to fend for ourselves. 12 & 13 the first time, that was an adventure in itself. Anyways, Yorkes have you always lived on York pen? I mean did you grow up living there? Hey crust I grew up in Adelaide and did my apprenticeship at Holdens when I left school so Yorkes was my go to spot pretty much every weekend. I've lived down the bottom end of the peninsula for about 12 years and it feels like home now. But I always try and get over to SA's West Coast a few times a year. Not just for the waves but because its a true frontier out there. Last year I went up to Lake Gairdner and Mount Ives Station on the way over to Cactus. It's great to get off the bitumen and onto the red dirt! Yeah weird little red dirty town, not much there. @crustt- Mum worked in an old folks home in Glenelg in the early 80's which is a beachside suburb in Adelaide so not the same one you must be talking about? But if you remember this funny buggers name I might remember him? It's a small surfing community down here, many have moved on but few are forgotton. Whether its through character or surfing ability there's been some memorable people that have spent time surfing down here over the years. @crusst- pommy steve, if it's the guy I'm thinking of I did my first trip to cactus with him and a guy named tony. Being the grommet I was mercilessly tormented by those guys but it was a rite of passage back in those days. He used to charge, saw him surf 10-12ft Dalys by himself once! 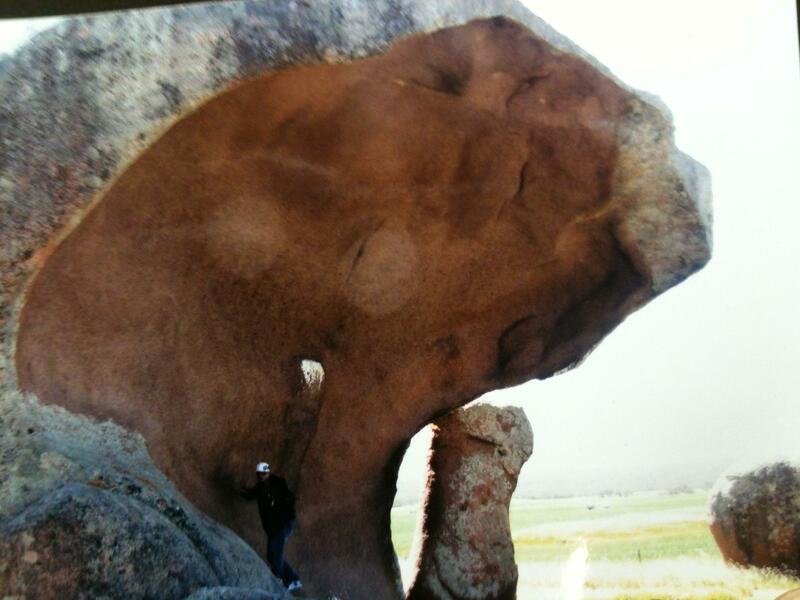 Found a few pics of unusual rock formations around the Eyre Peninsula and Gawler Ranges. They call it Granite country. Nice pics, will have to have a poke around there when we are on our way west, my missus has a good little business doing landscape photography, so she loves SA. Gee Yorkesurfer, I didn't know they invented submarines that long ago, thee ol captain would of go a rude awakening opening the lid to find dry land. Nah crustt I have a more modest camper trailer that I tow behind my Pathfinder. Dunno how well that massive van would go off road but it sure looks comfy! If you google Gawler Ranges there's more pics/info on what's up there. It's a photographers paradise, your wife will love it. 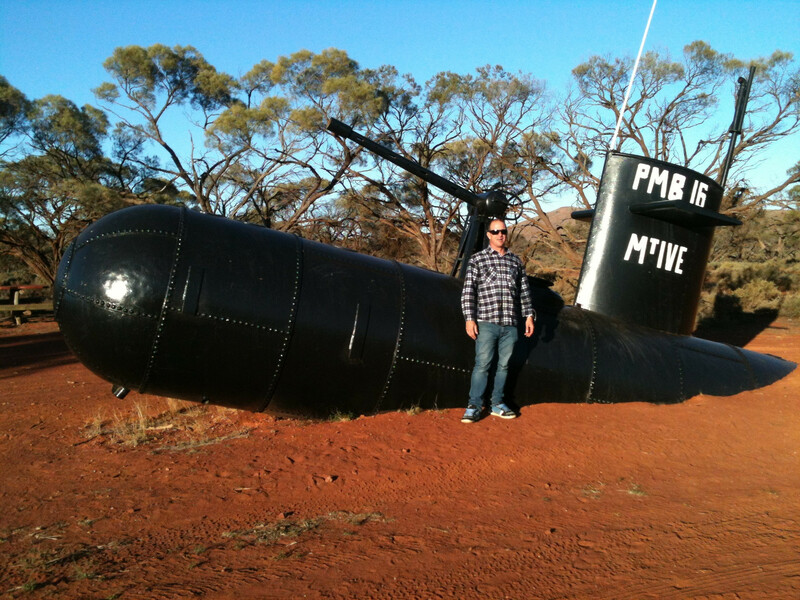 And Welly yeah that submarine is crazy out there in the desert. A 4wd club built it as a tourist attraction. The nearby Lake Gairdner sure isn't deep enough to submerge it. It's one of the driest flattest salt lakes in the world and has been the site of various land speed record attempts over the years. Wow, epic stories YS and TGF, love reading about this stuff, especially about places hardly any one has ever been!